I am currently connected to two Irssi instances coupled with screen. One instance at home, for all my personal IRC needs, and the other at a corporate LAN for secure inter-office IRC messaging. It works great, except when someone tries to get a hold of you (a highlight). I haven't found any good way for Irssi to notify you when you have been highlighted in a channel. For the past couple years, it hasn't been bothering me. Then, I found a pretty slick notification system for Irssi, and now I'm hooked. Here is a how-to for getting a GUI notification on your desktop (Gnome or KDE) when someone highlights you in a channel. For this tutorial, it assumes that Irssi is running on a box separate from your current local machine that you have SSH access to. 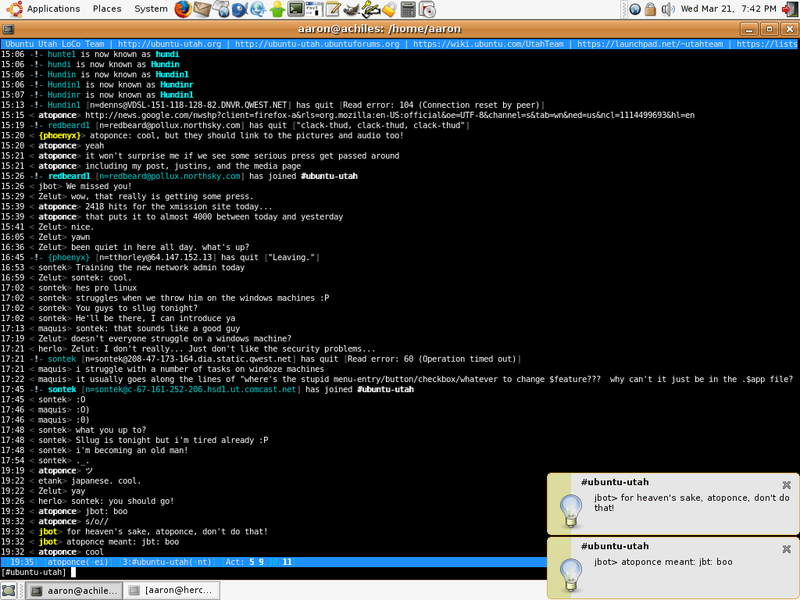 For example, at work, we have an inter-office server that is running an IRC server. I just SSH into that server from my workstation, fire up screen then Irssi, and connect to it. Irssi is running remotely from my desktop. This is also the case for my personal Irssi session. So, in other words, Irssi is running under screen remotely, and you connect to that session from any other computer via SSH. aaron@achilles:~$ cd ~/.irssi/scripts/autorun && ln -s ../fnotify.pl . When running, it creates a file called 'fnotify' in the ~/.irssi/ directory. It is just a plain text file containing all the times you have been highlighted in a channel, one highlight per line. Now, we just need to write a shell script to send us the GUI notifications. This can be done with a simple Bash script (yes, from the same page we got the Perl script for Irssi). Save it anywhere on your local box (not the box that is running the Irssi instance; like your workstation, for example) and execute it (here, I saved it as 'irssi_notify.sh'). In the script above, you need to replace 'remote.system.somewhere' with your server that you are connecting to. The script makes an SSH connection to the server that you specified, and parses through ~/.irssi/fnotify one line at a time. Each line gets its own notification. That line is then removed from the file, so it doesn't continuously grow as you continue to get highlighted in channels. 1. If the screensaver kicks in, and you are highlighted in a channel, you will not receive a GUI notification. This is default behavior with libnotify-bin. Thanks to Clint for bringing this to my attention! Click for a larger screenshot. Posted by Aaron Toponce on Wednesday, March 21, 2007, at 7:45 pm. Filed under Perl, Scripting. Follow any responses to this post with its comments RSS feed. Comments are closed, but you can trackback from your blog. For IM, Email or Microblogs, here is the Shortlink. OR, you can disable visual-bell (vbell) in your screenrc so you get an audible beep when events occur. Aaron, didn't work for me here. The bash script was giving me issues, and I didn't go through troubleshooting it tonight. I may try again tomorrow. Brad, I have tried your way as well, and it doesn't seem to work for me as well. I would love to have notification like this though, that is the one thing I miss from Konversation. Bash script had a syntax error in it as pasted from the site. I also tweaked mine so that it doesn't spew the last ten events when it starts up, and has a rather less ridiculously long notification duration. Woops, guess I need to escape the script to get it to appear here. Okay, maybe not. Sorry about the mess Aaron. Nice idea, except I'm not too fond of popup notifications. Might be fun to try to make this work with zenity --notification instead, for a less "in your face" solution. Would be nice mentioning where you got it from. Brad- I have never gotten that to work. Not sure what I am doing wrong. Nixternal- I works in KDE. I'll get with you online, and we'll figure it out. MattW- See my next post on the blog. It's missing a semi-colon. Ben- Yeah. This definitely is not for everyone. If you getting working with zenity, post your solution. I'd be interested seeing it in action. Brian- I posted two links to the same site, giving attributed credit where credit is due, as well as to Clint, who brought it to my attention to begin with. You might also be interested on Irssi Notification, a cleaner approach for the same end result which uses irssi's proxy's. I saw the same message when i did try using /run. It works perfectly here, but I had to modify the script to watch a whole channel instead. I use libnotify, screen and irssi over ssh. I did't like any of the solutions i found and decided to implement it myself using the terminal 'print' functionality available on xterm and other similiar terminals. irssi sends the print escape codes and the info I want to include in the notify wrapped in the appropriate escape codes and XTerm "prints" it to a shell script which calls notify-send.